This book truly is a Gastronomic Journey. This is the tails of Susan Buckley after she met and married her husband Peter Buckley. There are also 28 recipes int he book so you can eat along as you read. 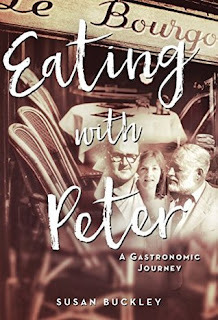 Peter Buckley was a writer, photographer, gourmand, as well as an inventive chef. The pair travel all over the world to eat basically. Peter loved to chat with the farmer who grew the ingredients, the chef who cooked them, and of course loved tasting the food. I am not real sure how Susan Buckley can remember what restaurant she ate at and what she ate in say 1973, when I can barely remember what I had for dinner last Thursday, but she does, and she writes a romping tale about it. I enjoyed seeing the world through her eyes in this book and tasting the dishes with her. It is a great book especially if you love food.